The playoffs kick off tonight for several area City Section high school football teams. Eagle Rock is the top seed in Division II as the Northern League champions will play 16 seed Hollywood (6-4) at 7 at Eagle Rock. The Eagles are 9-1 and have won six consecutive games since losing to Fairfax. Eagle Rock completed a perfect (5-0) run through the Northern League by defeating rival Franklin, 56-7 last week. Cantwell Sacred Heart of Mary High School quarterback Anthony Ruiz looks for a receiver in last Friday’s game against Bishop Montgomery. The Cardinals captured the South Catholic League title with the 38-23 victory. The Eagle Rock-Hollywood pairing will be the second meeting of the season between the teams. The Eagles won the first one, scoring a 35-0 victory over the Shieks in a Sept. 8 nonleague game. Roosevelt (5-5) is the Division II seventh seed and will play host to 10th seed Washington (3-7). Franklin (5-5), the 14th seed, travels to third seed Reseda (9-1). In Division I, Garfield (5-5) is seeded fourth and plays Taft (2-8), at Garfield. The Bulldogs finished second after winning four consecutive Eastern League titles. Garfield’s record arguably is misleading. All 10 of its opponents are in the playoffs and three of them are league champions, including Crenshaw, the second seed in the Open Division. The Bulldogs face a tradition-rich team in the Toreadors who have stumbled to a 2-8 record and are seeded 13th. Torres (6-4) is the No. 4 seed in the Division III playoffs and will play No. 13 Jordan (5-3) at home. The Toros are led by one of the City’s best players in running back Tiquan Gilmore, a 5-foot-10, 165-pound speedster. Sixth seed Wilson (5-5) plays 11th seed Poly (3-7) at home. The Mules rallied to finish third in the Northern League with victories over Franklin, Torres and Lincoln. The Southern Section playoffs involving local schools are on Friday at 7 p.m.
Schurr (9-1) is the No. 1 seed in Division 11 and faces Santa Ana Valley (3-7) at home. The Almont League champion Spartans roll into the playoffs winners of seven straight games. Montebello (7-3) travels to play Pasadena Poly (8-1-1), the Prep League champion, in the Division 10 brackets. The Oilers finished second in the Almont League after winning the title four consecutive years. 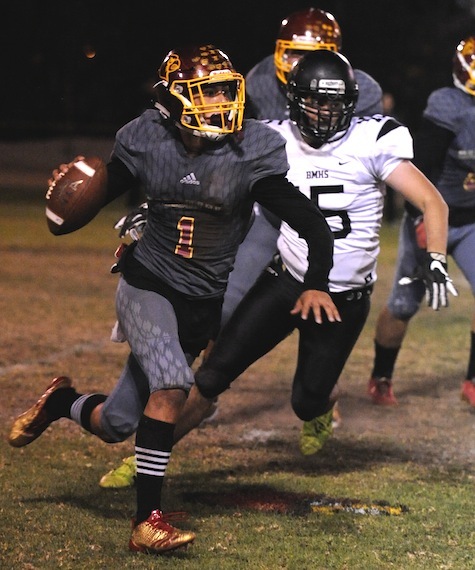 Bell Gardens (5-5), which finished third in the Almont League, is paired with second seed Santa Ana (9-1), the Golden West League champion, in Division 12. The teams play at Santa Ana. Cantwell Sacred Heart (6-4), which won the South Catholic League, plays Orange (8-2) at home in Division 13.